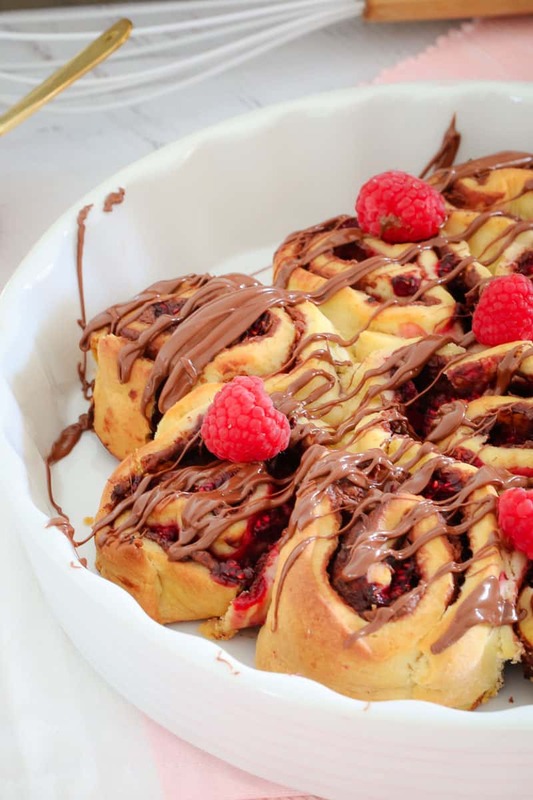 These Raspberry & Nutella Scrolls are a chocoholics dream! 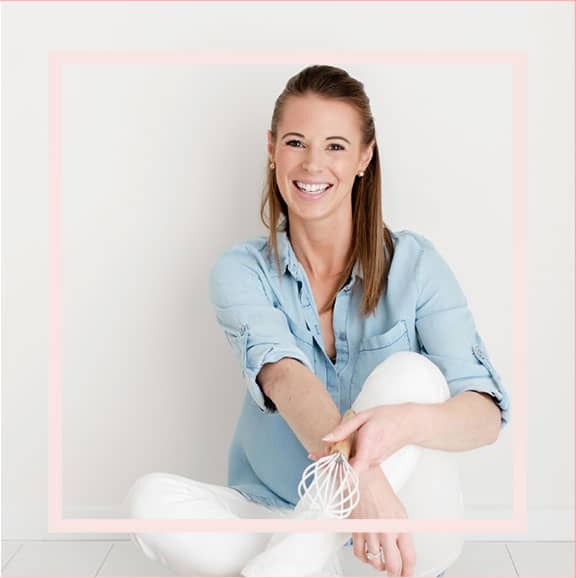 They take less than 10 minutes to prepare and require no proving time at all! These freezer-friendly scrolls are the perfect lunch-box treat! Do you know what I absolutely love???!!! Scrolls. Yep, I’m a pretty easy to please gal. It’s the little things in life that make me happy… and scrolls are one of those things. A while ago, I shared my recipe for my Apple & Cinnamon Scrolls and honestly they’re absolutely delicious. I think my favourite thing about them is that (unlike a lot of other scrolls), they don’t need any proving time at all. You simply whip up the dough, roll it out, add the fillings, roll, slice and bake. How easy is that!? 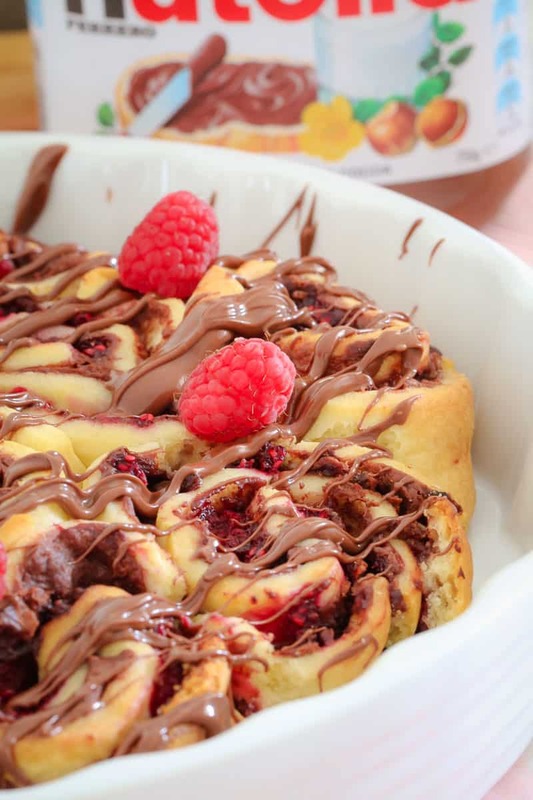 These Raspberry & Nutella Scrolls use the exact same dough as my apple & cinnamon ones. It’s made from totally basic ingredients (butter, self-raising flour and milk) and is really easy to prepare. You might notice that there’s no sugar in the dough, which may seem weird given that these are sweet scrolls, but trust me on this one. 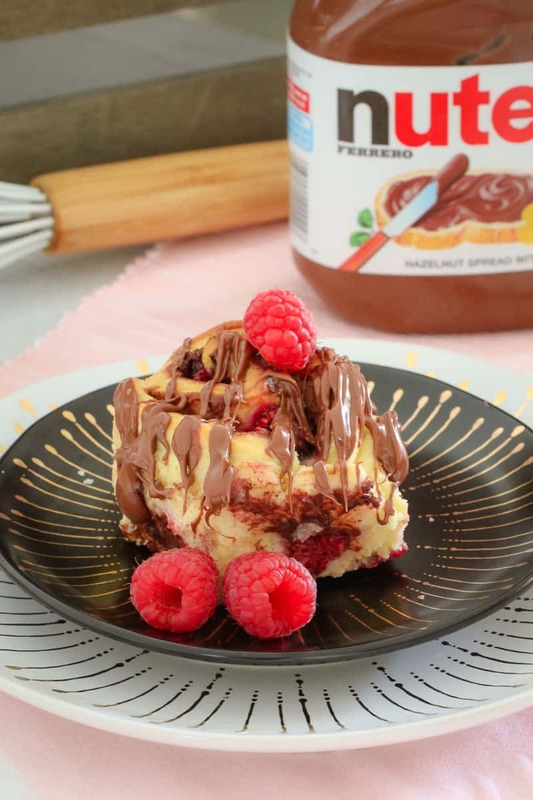 The Nutella and raspberry filling is by far sweet enough (geeeez… it’s not often that I say that something is sweet enough!). Anyway, these yummy little scrolls are perfect served either warm or cold. I must admit that it’s pretty rare for me to make a batch of these and not eat at least one while they’re still warm. Hey, someone’s gotta do the taste-testing, right!!?? BUT! If for some reason you can’t possibly eat ALL of the scrolls within a few days, they can be frozen for up to 3 months in an airtight container. YUM!!! 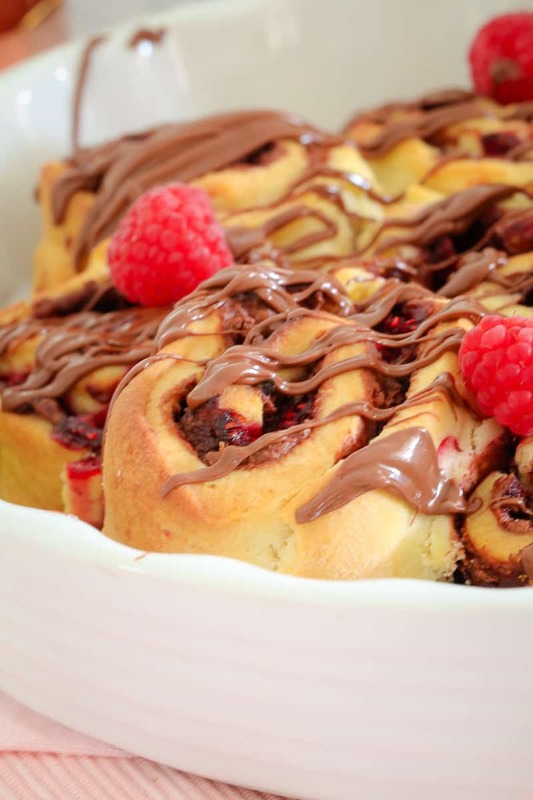 So next time you’ve got a jar of Nutella sitting in the cupboard, please, please make a batch of my Raspberry & Nutella Scrolls. They’re the second best way to eat Nutella (the very best way is obviously straight out of the jar with a spoon!!). 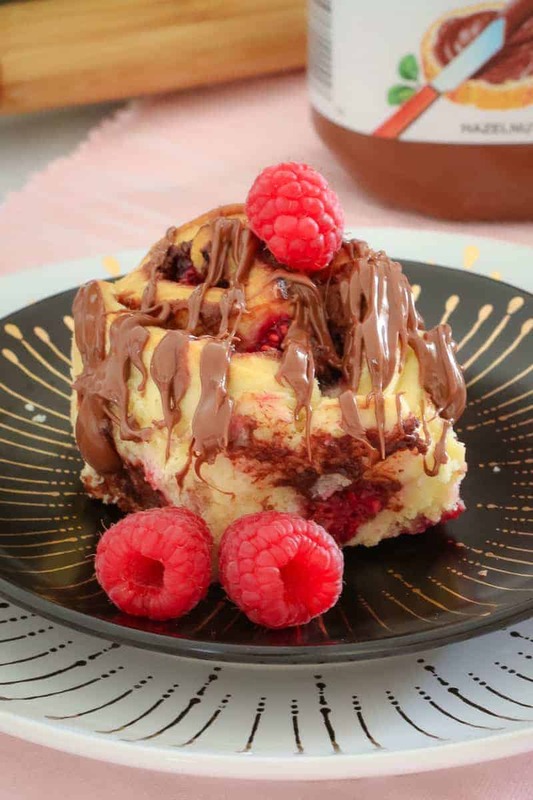 These Raspberry & Nutella Scrolls take 10 minutes to prepare, require no proving time at all... and taste amazing! Freezer and lunch-box friendly! Roll the dough out into a large rectangle (about 4-5mm thick). 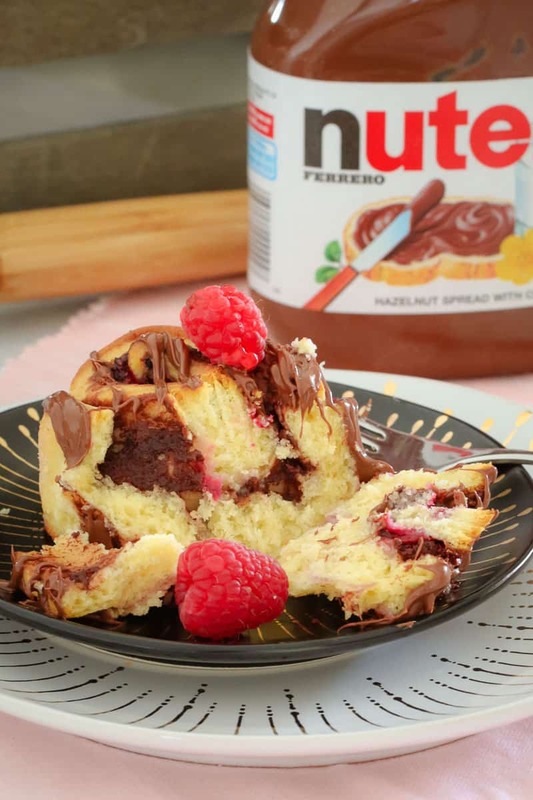 Spread over the Nutella and sprinkle over the defrosted raspberries. Use a sharp knife to cut the roll into 10-12 pieces. Place the pieces cut side up into the prepared cake tin (allow the rolls to slightly touch one another as this will help them to rise). Melt the extra Nutella in the microwave and drizzle over the top of the scrolls. 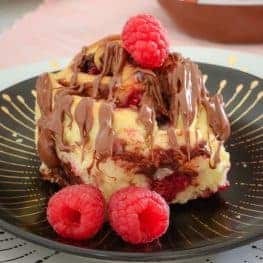 These Raspberry & Nutella Scrolls Scrolls take 10 minutes to prepare, require no proving time at all... and taste amazing! Freezer and lunch-box friendly! 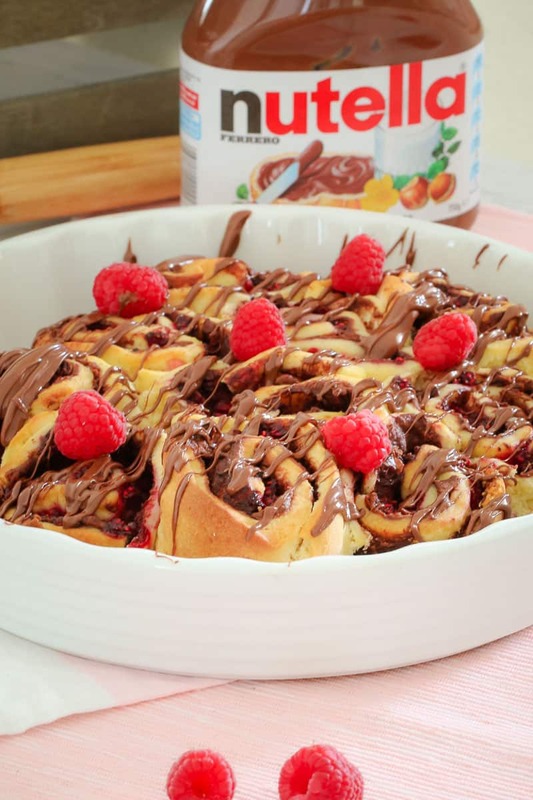 Spread the Nutella over the dough and sprinkle over the defrosted raspberries. Bake for 15-20 minutes or until golden brown and hollow when tapped.